The Datrek Superlite II stand bag features an 8-way top for club organization. The top features 2 full length dividers, an integrated rubberized handle and a dedicated putter well for oversized clubs. 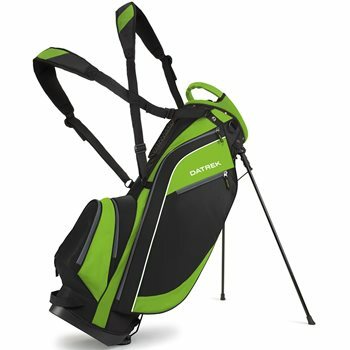 The stand bag is lightweight for carrying at 4.4 pounds and includes ergonomic double shoulder straps and a cushioned hip pad for comfort. The Superlite II is equipped with 5 zippered pockets, including a full-length garment pocket, 3 accessory pockets and an oversized ball pocket. Additional features of the bag include easy grip zipper pulls, an umbrella holder, a matching rain hood with dual access, pen and divot tool holders, and an insulated cooler sleeve. Excellent quality for price... enjoy the light weight for a quick nine holes ?? Not the biggest or most expensive bag but it's perfect for easy use. Light to carry. Very accessible packets. I have two pro leather bags but they are heavy and just over kill for what you really need in a basic golf bag, I love this thing. Bag is perfect and super lite even when loaded with clubs, definitely worth it.